Olympic Clinics are themed around the Summer/Winter Olympic Games, with a strong focus on athletic development, more specifically, running and jumping technique, speed and agility improvement. Participants will focus each morning on athletic training, in addition to agility and speed and general athleticism. Later in the day, students will engage in a wide variety of modified Olympic events and games, compete as individual in small teams. NSSA's Multi-Sports clinics are a staple of NSSA's multi-sport athlete philosophy. These clinics are designed to provide opportunities for young athletes to play to a variety of different sports, improve team building skills through competition, and develop socially with kids in the same grade range. Our program is structured so that each individual will learn the fundamental skills of 12 different sport and the basic rules of the games. All of NSSA sport specific clinics focus on age appropriate, skill development, with a strong emphasis on the core fundamentals skills using our 3 tiered development model (Steps 1, 2, & 3). Participants will engage in various skill drills and modified games throughout the course of the 4-days. Each clinic has its own specific curriculum tailored for each specific age group lead by a highly qualified coach with HS, College, or Club Experience in that sport. All of programs stress the importance of having fun while improving. The proficiency clinics are designed for players who are looking to specialize and focus on taking their game to the next level. The transition period from grades 7 to 9 is challenging as players need to become physically, technically, and mentally prepared to compete at the next level. These half day programs are sport specific with a detailed skill/tactic focus designed to be better prepare athletes for competitive play at the HS level. Instructional programming runs from 9am-2pm. Location: All clinics this year are being held at Miscoe Hill Middle School, 146 North Ave, Mendon MA. The Upper Gym will be our new home this year. Program: NSSA runs high quality, age appropriate training programs and curriculums, each specifically designed around the concept of reinforcing proper fundamentals, introducing advanced skills and concepts, in a fun and enjoyable environment. Cost: $135 per week, and/or $35 per day or $20 per half day. Registration: Register online in advance online (preferred), or walk-in and register and pay at check-in on any day. Payment: Pay online when you register (prefered), or defer payment until day 1 of each week by choosing the pay by check option at the check out window. Paying by Check: The NSSA registration cannot calculate day rates, 1/2 day rates, extended care, or other unique rates.If you are looking to pro-rate your order, you must register online and use the "pay by check method". NSSA staff will collect your payment at check-in to ensure payment is accurate. You can uss this same method of payment if you simple prerfer to pay with cash or check. Participants are free to bounce back and forth between two or more clinics that are running at the same time. This is an ideal opportunity for multi-sport athletes or for players who are interested in trying something new. When registering, please select the preferred clinic your child wants to participate in. If you do not want your child to switch sports, please let both NSSA and your child know. Place orders in the morning at drop off, or order food in advance for the whole week. STEP 1 programs are designed for players grades K-3 and focus on developing proper fundamental and introducing to sport specific skills. 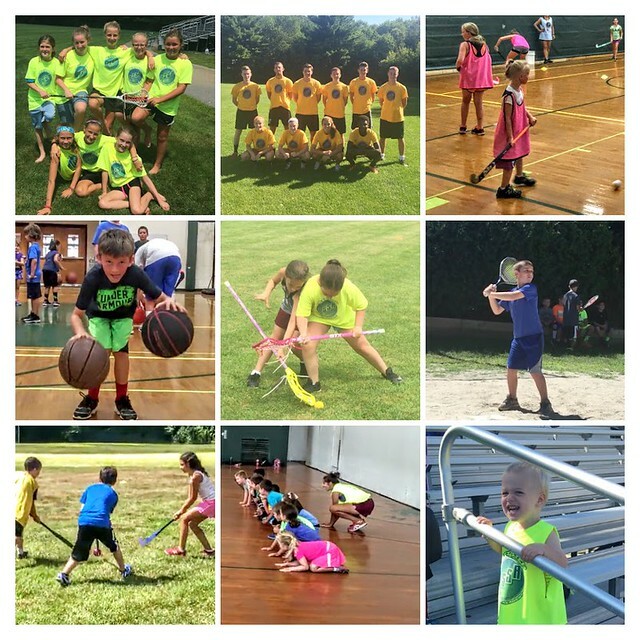 Step 1 clinics are designed around having fun and sharing our love and passion for the sport through modified games that engage all participants while introducing age appropriate skills. STEP 2 programs are built around competitive play with a focus on skill development. Players will engage in variety of skill challenges, competitive games and team games. STEP 3 Programs are content specific and our designed to focus on different aspects of the sport. These clinics are high intensity, with a strong physical demand, limited breaks, thus are only half day programs.